A lot of people have a problem when it comes to their wardrobe. It is all too easy to hold onto garments that remind us of a first date, special holiday or happy time in our lives. In actual fact, hoarding these clothes does not preserve the memory any better than a photograph. You wardrobe needs to contain a selection of clothes suitable for all the possible situations that you may need to dress for. These situations are entirely unique for all of us and are ever changing. Your wardrobe should be dynamic – it should adjust and change with your life. It is not a storage box to archive clothes! A stained shirt might be useful for painting, but do you really need five of them? That old pair of trainers may be useful for a muddy walk or as a spare set for the gym, but not several pairs! If you don’t wear more than half of the items of clothing in your wardrobe in a given year, then you have a major problem! 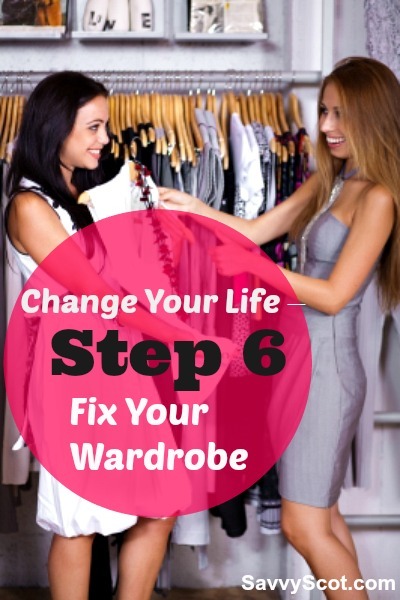 You need to sort through your wardrobe and then buy new clothes! Make a list of clothes that suit your lifestyle. If you work in an office this will likely constitute several shirts, ties, jackets, blazers and trousers. If you work in a less formal setting, polo shirts/jeans/chinos are good. Make a proper list and check what is missing from your current wardrobe. Take the list into a store and show a sales assistant. Don’t be embarrassed to ask for help! Seek out good quality clothes – if you get a good feeling about something and fall in love with it – BUY it immediately! If you are not sure – leave it. Repeat the process in different stores until you check of all the items on your list. Make sure that you buy high-quality clothes which are plain where possible. Fancy designs detract from your face and can quickly go out of fashion. Spend a bit of money now and invest for later. Don’t buy clothing that you might one day fit into after your new diet because they are on sale – that may never happen. Above all, buy things that make you look good. If you are athletic and have a decent body – tightly fitted clothes will accentuate your features. Carrying some extra weight? Buy stripes and clothes that don’t hang to your hips… You get the point. Don’t be afraid to take someone with you shopping and ask them if you look good. You want to do this right and you want to make a lasting impression. We are all subjective beings and like it or not, all make judgements from the moment we lay eyes on someone. First impressions count and clothes have a LOT to do with them. Someone in a sharp suit, wearing smart cufflinks, a tie and jacket look good. Be honest, what is in your wardrobe that you could throw out today? I really need to go through my closet! I have so much that I do not need. My wardrobe could definitely use some updating. I’ve been wearing the same style clothes for a long time. Now that I’m 32 I should probably dress more mature, especially since I work downtown amid the suit & tie crowd. Luckily I can dress casual for work, but I probably should at least replace my ratty shoes and get a decent jacket. Only problem is that I hate going shopping and I’ve turned into a bit of a cheapo. Being a cheapo makes it hard to part with cash… I often find that I have to go for a blow out and get new stuff all at once. Easier breaking the cheapskateness once! Hmmm, I do have a relatively decent wardrobe I guess and could probably toss out a couple things.I’m very picky about my clothes, quality and fit. No one buys me clothes, I buy my own. Mrs.CBB on the other hand well, she takes the walk in closet, the spare room closet and her dresser for clothes. Don’t even get me started on shoes. She had this bloody Christmas Sweater that was awful and she loved to wear it every year on Christmas Day, needless to say it’s been donated. [email protected] recently posted..In The Face of Taxmageddon? I live with a fairly small wardrobe, I think it stems from my tight grip on my wallet refusing to let money out. When I am done with most of my clothes the wife and I like to donate them to the local charity as there are often others that need them more than we do. Hey, just finally seeing if maybe my comments will show up now. I think what I said was that I really don’t have too much in my wardrobe I can get rid of. I wish I could buy a few more things! Budget and the Beach recently posted..Changing Course/$20 Amazon.com Giveaway! Great post! I just spent sometime over the weekend and purged some old clothes that I no longer had interest in wearing. After all was done, I think I donated roughly 30 pieces of clothing to the goodwill. Sounds like a great exercise! Bet it felt good to donate?